Compulsions in this and other categories are most often performed for the purpose of relieving the anxiety caused by obsessive thoughts. However, there are several sub-categories which do not exactly fit this pattern. One subgroup which does fit this pattern takes in those whose touching or moving takes the form of magical or superstitious rituals. The story of the young boy featured in the video “The Touching Tree” is a good example of someone performing a magical touching ritual. By magically connecting things which do not connect in the real world, these sufferers are trying to establish control over dislikable thoughts or events to keep them from happening in the future, to ensure that certain desirable things will happen, or to undo previous happenings or thoughts, which would lead to such events. Perhaps this type of touching could just as easily be classified under magical or superstitious compulsions, but touching and moving are so distinctive that I believe they constitute a separate category in their own right. There is a good deal of overlap between symptom groups anyway. Those who think in superstitious and magical ways are not ‘crazy’. They will be the first to say “I know this sounds strange, but…” It is the strong feelings of doubt and anxiety which keep them working at compulsive activities. They feel that they dare not take the risk or chance of their feared consequence occurring. Magic usually involves rituals, and rituals must be performed “perfectly” in order to work. Ritualistic behaviors must be performed certain numbers of times or in a particular order which is usually invariable (There is some overlap here with compulsive counting). Sometimes things must be touched until they “feel right.” You will typically see “touchers” tapping, grasping or touching things an odd or even number of times or up to a special number of repetitions. If a ritual is performed wrongly, or if an unpleasant thought or image comes to mind (contaminating the ritual), the sufferer will generally have to stop and do it all over again. Because those who do rituals are anxious and because anxiety hampers a person’s performance at almost anything, it is not unusual to see people touching things as much as several hundred times before they can stop. Some touchers can be seen to have calluses on their fingertips as a result. Unfortunately, compulsions only provide a kind of illusory short term relief from anxiety. The long term result is only more anxiety. The more they are performed, the greater the behavioral ‘addiction’ which develops, until eventually they can almost engulf a sufferer’s entire day and every activity. Objects sometimes have to be touched in special spots. Frequent targets for touching are the edges or corners of things, or any surface irregularities such as bumps, cracks or rough spots. Sometimes stains, spots or marks are also singled out. Where sufferers have to walk or move in special ways, they sometimes use marks or irregularities on the floor to step on, around or over. Doorways are also common sites for touching rituals, which have to be performed either before or after the individual walks through or past them. For instance, touchers will sometimes have to touch door posts before entering or leaving a room. Sometimes the act involves touching a door before it can be opened or closed. It is not unusual for touchers to get “stuck” — to not be able to enter or leave buildings or rooms until they get their ritual right. Some sufferers can also be seen to be “stuck” sitting on chairs or sofas in the same way. They may sit for as long as half an hour or more before they perform their touching correctly. Other common events which can become incorporated into a person’s touching rituals are the opening and closing of drawers, bottles or boxes. Picking up objects and then setting them down in special ways is also a variation on this type of behavior. This frequently is seen during such activities as dressing, shaving, washing, writing, etc. One of the more unusual looking magical movement compulsions is a type of “undoing” ritual where an individual must cancel out other “bad” movements they have made by doing them in reverse, much as you run a film backwards. It is possible to see someone walking out of a room backwards, making every move and gesture in reverse. A third subgroup moves or touches compulsively simply to satisfy a distinct urge. There is no “bad” consequence for not performing the behavior other than that it will keep nagging at them. One of my patients described his efforts to resist as being similar to holding back the need to sneeze. The impulse can be delayed, but it cannot be resisted completely. These compulsions are similar in many ways to tics, and might even be diagnosed as such in some cases, although this can be a kind of gray area. There is not always a clear distinction between a tic and a movement or touching compulsion. I do not believe that anyone has ever really been able to establish where such a difference might lie. In any case, it would appear that there are some links between this type of compulsion and Tourette’s Syndrome (TS). Tics themselves are not uncommon in OC sufferers. There does, in fact, appear to be some genetic connection between the two disorders, and it is interesting to note that, for some in this category, the drugs Risperdal, Zyprexa, Geodon, Abilify, and Seroquel (which are used to treat TS) can be useful additions to the antidepressant medications taken for OCD. The match is not complete, however, as these sufferers do not exactly meet the diagnostic criteria for TS. For instance, there may be no history of vocal tics or an onset before age 21, both of which are required for a diagnosis of TS. There are other diagnoses such as Chronic Motor or Vocal Tic Disorder or Tic Disorder Not Otherwise Specified which come a bit closer in terms of their criteria. The diagnostic blurring we see between tics and movement compulsion clearly indicates that this is an area which requires more research. What can be done about these behaviors? The dual approach of medication plus behavior therapy has been shown to be the most effective treatment package. The use of antidepressant medications, including Anafranil, Prozac, Zoloft, Paxil, Luvox, Celexa, Serzone, and Effexor can provide a measure of relief by lowering the level of superstitious obsessions as well as the urge to move or touch. As mentioned above, the addition of small amounts of Risperdal, Zyprexa, or Seroquel to one of the above drugs has been reported to help treat some of the more resistant cases in this category. Due to the fact that it cannot totally eradicate all symptoms, medication cannot do the job alone. Medication’s most important contribution is that it can enable individuals to feel strong enough to successfully engage in behavioral therapy. In behavioral therapy, the basic principles are to gradually face the anxiety through the use of compulsions. In this way, sufferers build up a tolerance for the anxiety and eventually get to the point where they do not have to respond to it compulsively to get relief. This is what constitutes Exposure and Response Prevention (E&RP). This approach is very effective for those in the magical touching and moving subgroup. Together with the patient, the therapist (usually a psychologist specializing in behavioral therapy) prepares a list known as a hierarchy, in which every feared thought and situation is assigned a number value anywhere from zero to 100 based upon how much anxiety it causes the sufferer. These are then placed in a ranked order and patients are helped to carry out assignments in which they work their way up the scale, gradually facing more fearful situations while resisting the urge to ritually touch and move. As a person in treatment moves up their hierarchy, their sense of mastery over the symptoms grows, and as they reach the upper levels, items which at first seemed impossible to face have now become approachable. In the case of the third subgroup (simply satisfying an urge to move or touch) a somewhat different behavioral approach would be used. This is known as Habit Reversal Training, a technique frequently used in the treatment of Trichotillomania (compulsive hair-pulling). It is a multi-component treatment which helps patients to become more aware of when and where urges occur, teaches them how to center themselves through diaphragmatic breathing and muscle relaxation, and then trains them to combine these with a special muscle tensing exercise which can compete with and block the compulsive movement. This is, of course, just a simplified description of the technique. It does require much practice and hard work to master. Further information about this technique can be found in Dr. Penzel’s OCD self-help book, mentioned below. As can be seen, there is effective treatment for all forms of touching and movement compulsions. Don’t just sit around feeling ‘stuck’ in both senses of the term. 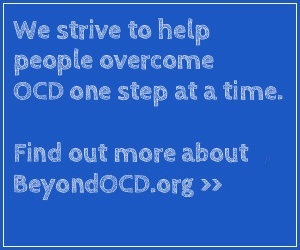 Many with OCD wait and suffer for years before seeking effective help. Try not to let yourself be one of them.